Now that our soil is dry enough we have been seeding and transplanting furiously! 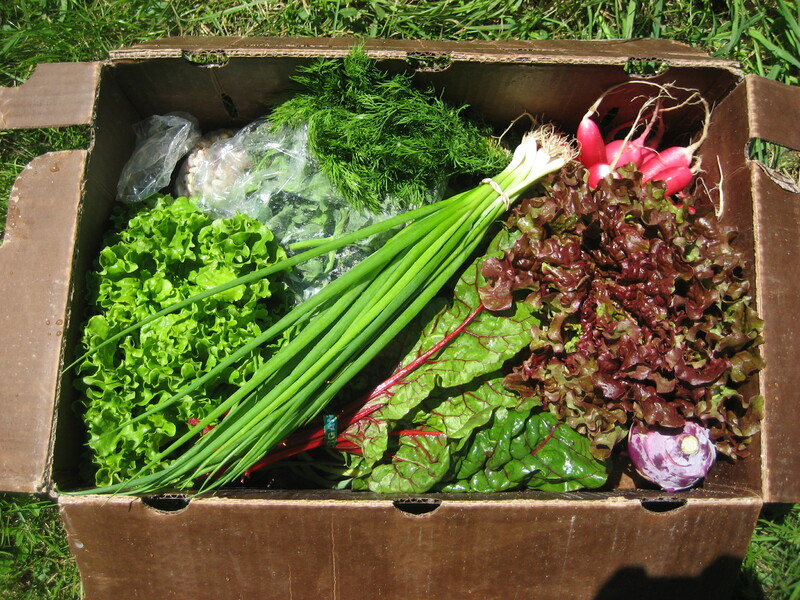 We anticipate CSA and market will begin in mid-June… Looking forward to seeing you then! Ahhh, spring on the farm. Harvesting nettles, indian plum leafing out, garlic putting on growth, snowdrops and daffodils blooming as well as a chorus of frogs and birds that fires up each morning and evening. These things bring, for me, an undeniable urge to get out to the greenhouse. To plan, plant, tend, and prune. Indeed, I’ve been logging many hours at these tasks as we prepare for the 2013 season! I have already started in the greenhouse: onions, shallots, leeks, scallions, cabbage, kohlrabi, lettuces, tomatoes, peppers, eggplants and more. We’ve even seeded a few crops in our large high-tunnel (a greenhouse where we plant right into the soil), in anticipation of the first CSA boxes of the season. 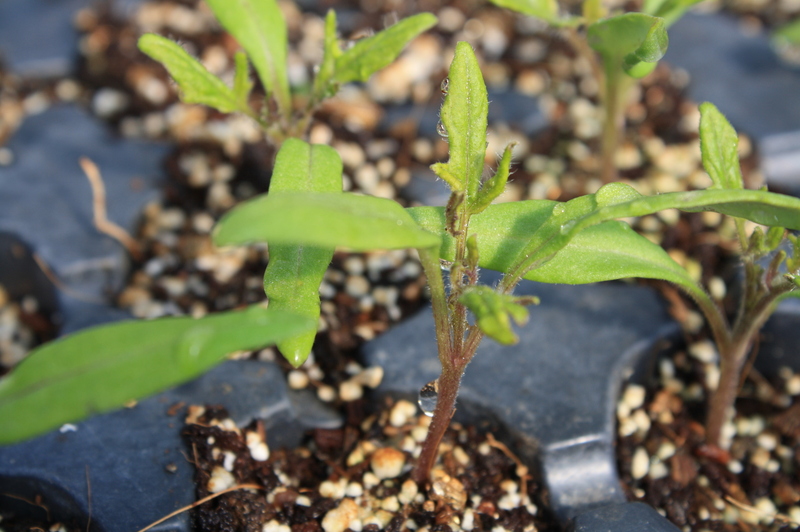 We’ll be expanding some crops in the high tunnels (heirloom and cherry tomatoes for example) and moving almost everything to our new fields up the road where productivity is higher and disease pressure is lower. The weather has been mild, everything is growing great in the greenhouses, and we have many returning crewmembers! It seems like this is going to be a great year for us. This spring, looking back on the photos and newsletters from last season brings a great feeling of satisfaction. It’s like a logbook of successes! 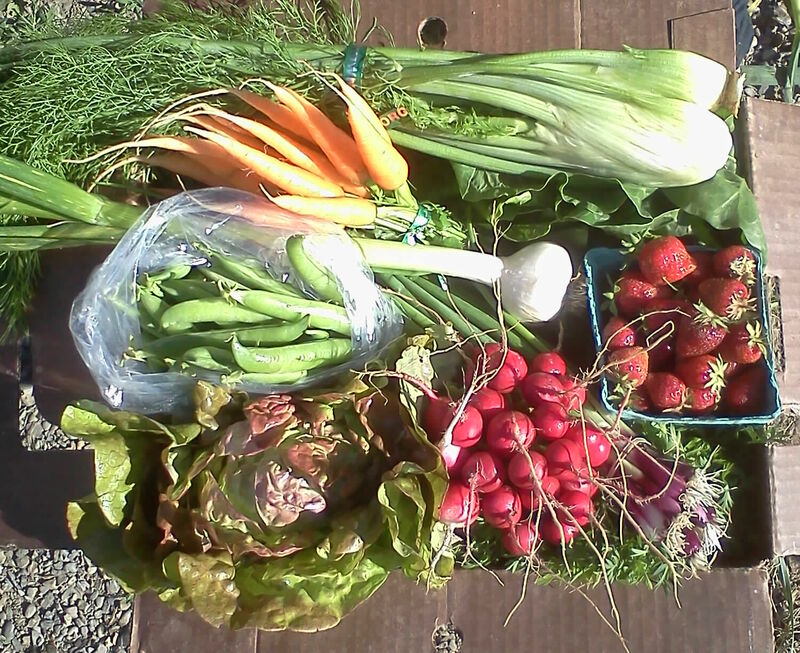 Each CSA box being the result of many, many hours of work and planning, months in advance of the harvest date. Ultimately, making it to your doorstep and into your family’s meals. I was also reminded that joining a CSA reduces your carbon footprint, reduces food packaging waste, boosts the local economy, preserves farmland for future generations, fosters environmental stewardship and gets us the freshest and tastiest possible vegetables and fruits. It’s a win- win situation! This is why we do what we do, and we’re proud of it. We hope you will join us again for another great year of produce, and reap the rewards of supporting a small, local, organic farm. This season we are offering a new drop site in Lacey (5610 30th Ave SE) and a 5% discount for everyone who signs up before May 1st. We will also be continuing to use only the recycled plastic totes for less waste and better quality produce! 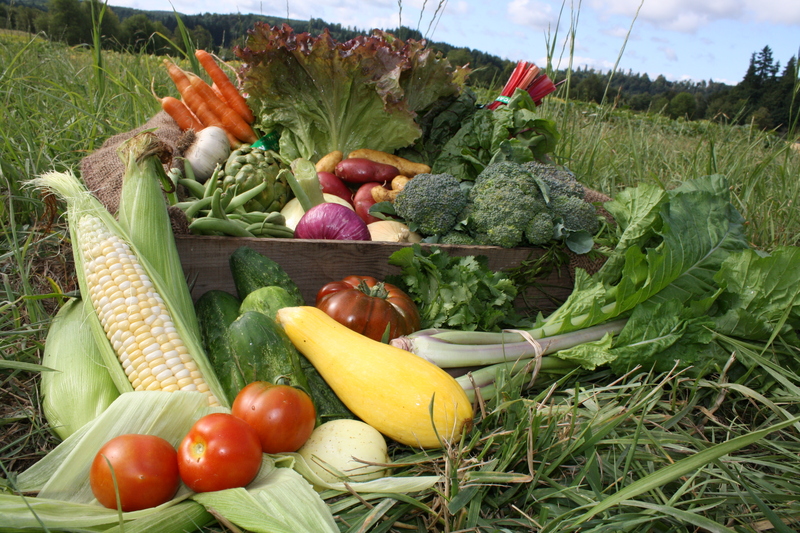 Its Time…Register Before May 1st for your CSA Share and Recieve a $25 Discount! 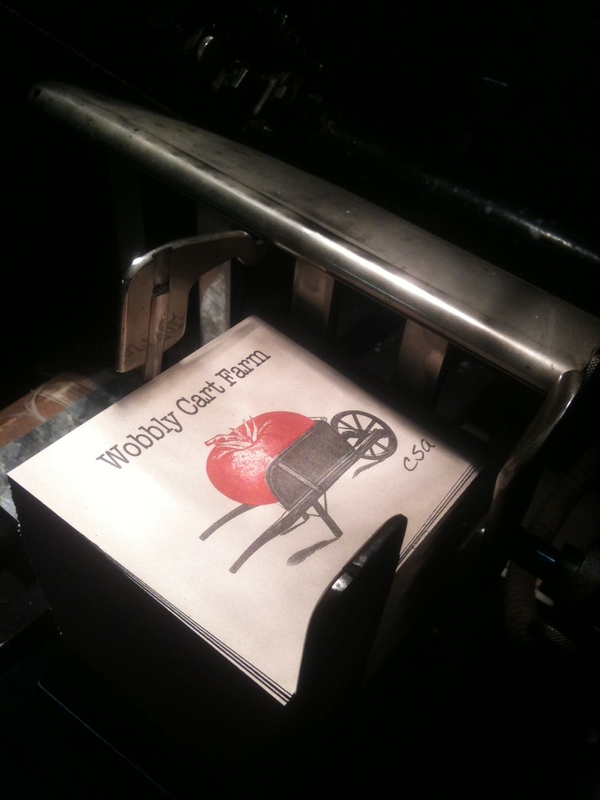 Register and pay for your CSA Share on our website http://www.wobblycart.com. 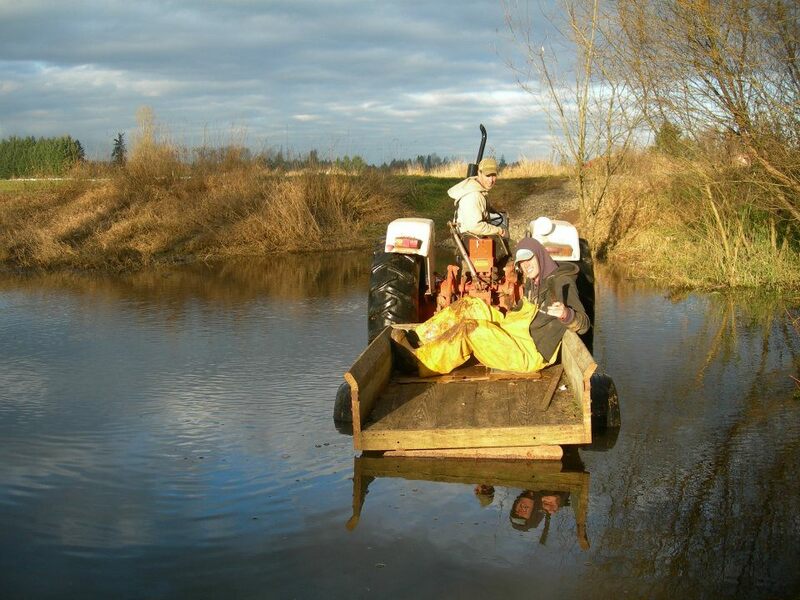 We have many convenient pick-up locations for you to choose from, East and West Olympia, Centralia, Chehalis, Northeast, Southeast, and Northwest Portland. We are also offering Full size and Half size shares. Spring is in full swing in the Wobbly Cart greenhouses! Tables are filling up with hundreds of trays of seedlings germinating and growing in anticipation of things to come. Onions, Leeks, Lettuce, Cabbage, Fennel, Tomatoes, Peppers. Eggplants. 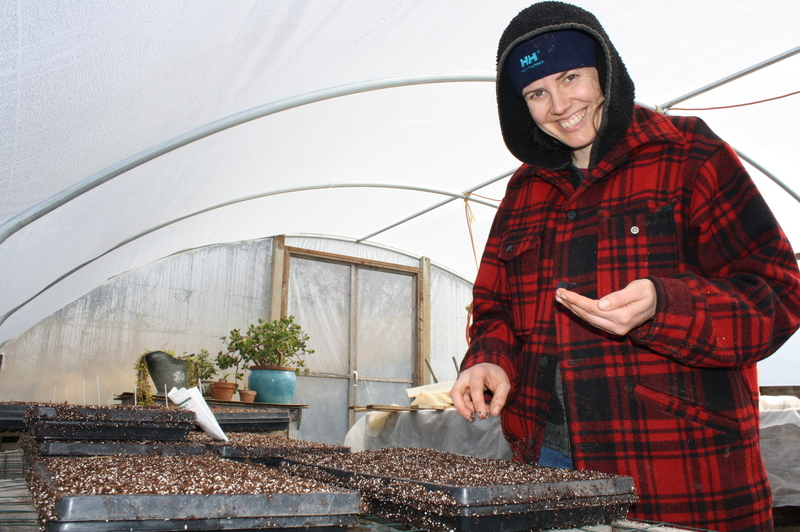 When it is 45 degrees and sideways rain outside , it’s nice to work with the tiny growing plants in the cozy shelter of the greenhouse. We’ve also got plantings started in one of our two hoop-houses (where the seeds are growing directly in the ground) and have almost finished the big end-wall doors that will make it easy for me to open and close, and for the big tractor to roll right through. 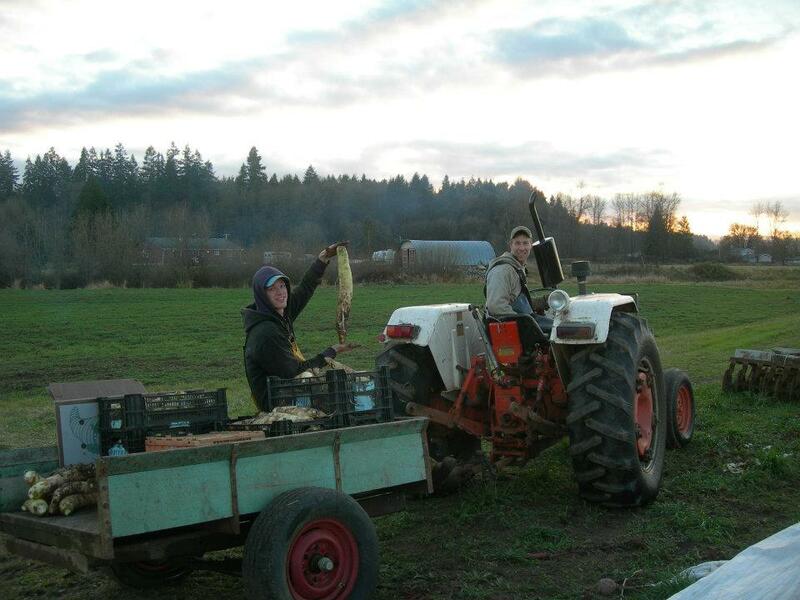 In the fields, Joe had enough of a dry spell to plow, disc and plant peas and a few other odds and ends! Hopefully, it won’t be long before we are eating all this good stuff! 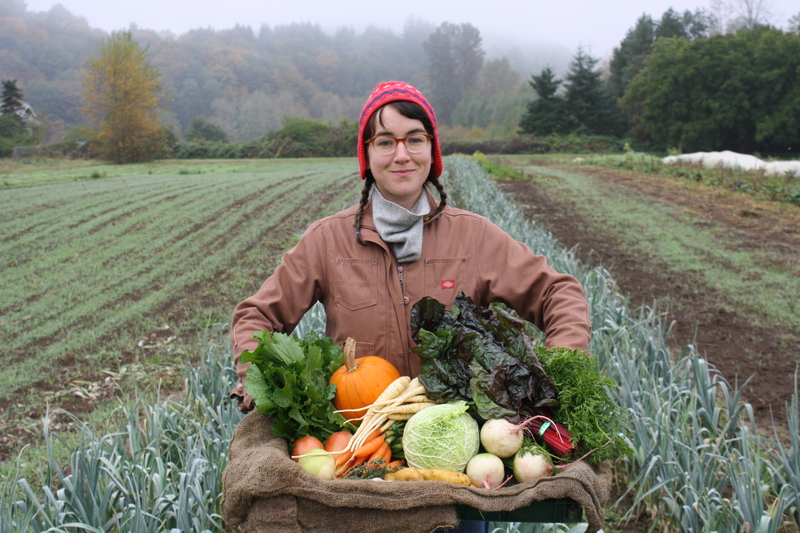 We are so excited for our season, and all the delicious and fresh produce to come! We’re also happy to offer our half-share option and new drop sites at the Departement of Ecology in Olympia (employees only!) and Southeast Portland (location to be announced). It’s easy to sign-up on our website or give a call to 360 273 7597 and I’ll be happy to send out a brochure. For those already signed up, Thank You! 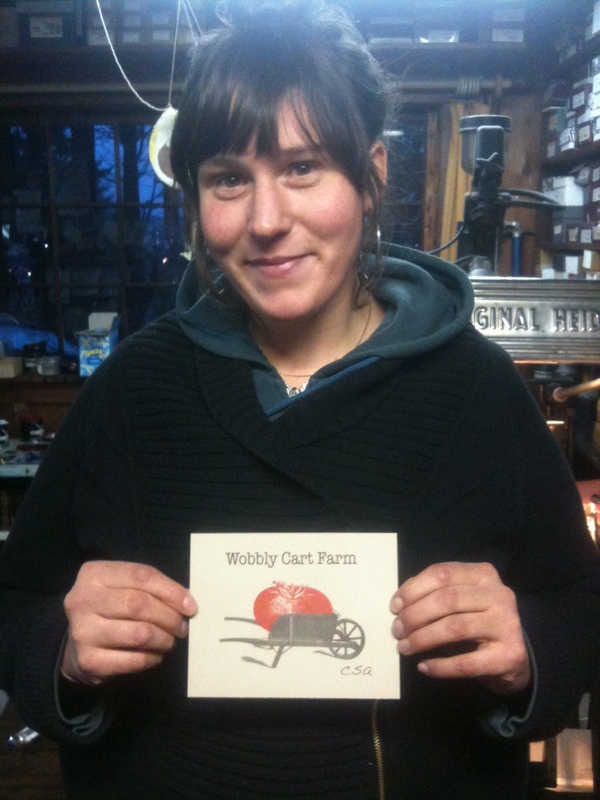 We are also pleased to announce that Wobbly Cart will be featured in a Local Spotlight Dinner with the Open Kitchen in Portland. The dinner will be happening May 19th, and Wobbly Cart produce will be paired with a young chef and featured on the menu. Check it out! 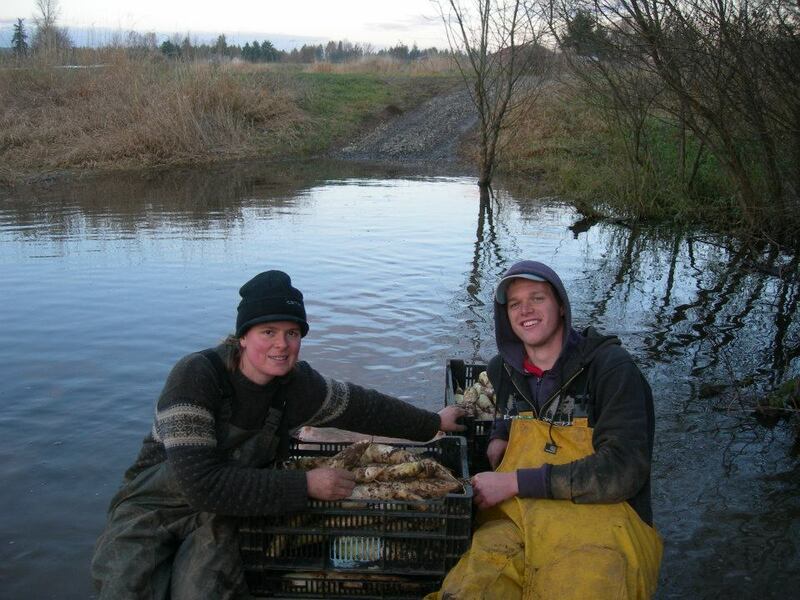 We’re still harvesting thanks to our new land and sunny December days! Liza and Marshall riding with the veggies through the moat.